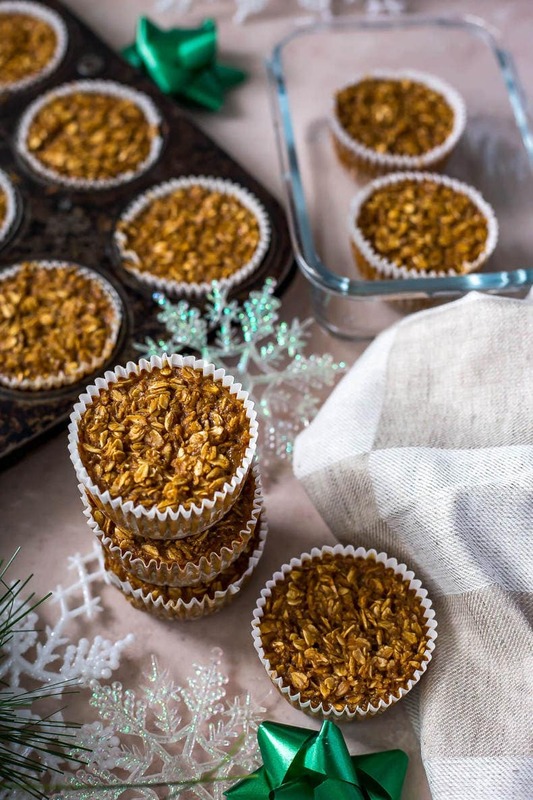 These Meal Prep Gingerbread Oatmeal Cups are a delicious, holiday-inspired breakfast idea you can make ahead to enjoy all week long – and they're gluten-free! 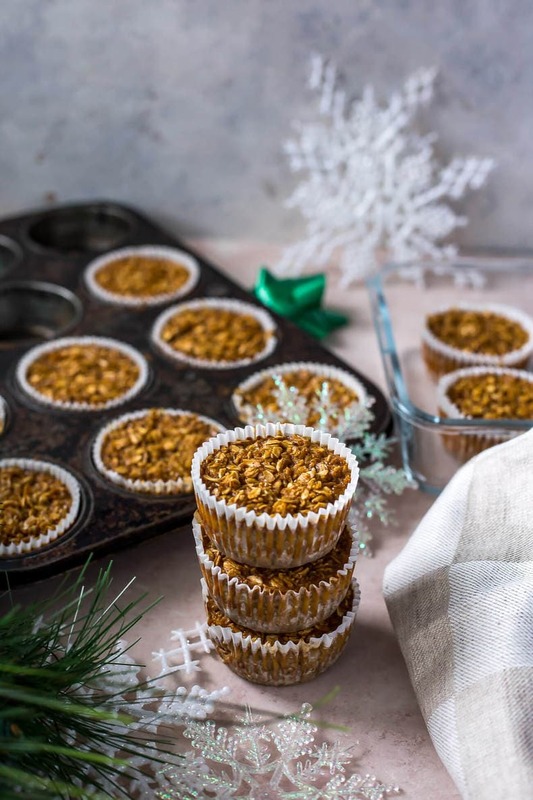 Say hello to your holiday breakfast dreams come true with these Healthy Meal Prep Gingerbread Oatmeal Cups! YES! I know what you're thinking. These are the cutest things ever. I've fallen for these Gingerbread Oatmeal Cups hard. Now, I should warn you that these aren't like a traditional gingerbread cookie per se. My brother (I think he's kinda become my official taste-tester) actually said he didn't really taste the gingerbread aspect at all, which I find kinda hard to believe. Maybe it's just me but the molasses really stands out as a prominent flavour in these Gingerbread Oatmeal Cups. It's so distinct but it's also a sweetener so I just used it sparingly to keep this recipe on the healthier side, but you can definitely add in more and cut back on the maple syrup if you're looking for a heavier gingerbread flavour (I would maybe do 1/4 cup maple syrup instead and add one or two more tablespoons of molasses in its place). These Gingerbread Oatmeal Cups aren't super sweet either and I think that's part of what I love about them. They're nice and light, and the best way to describe them is that they are kind of in between a muffin and baked oatmeal with a chewy texture that I adore. 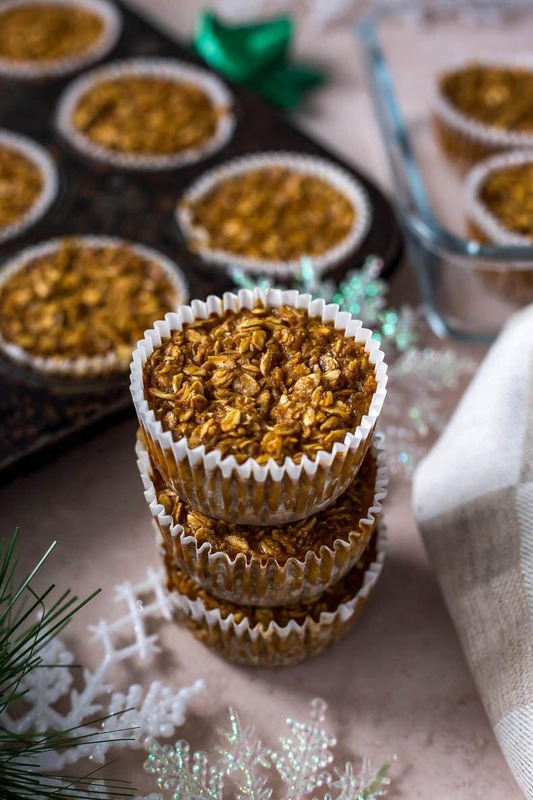 Not only are these Gingerbread Oatmeal Cups healthy enough to eat for breakfast, they're a good alternative to holiday baking or snacking while getting in the Christmas spirit. Pop a couple of these into a glass meal prep container and you've got breakfast on-the-go or a tasty, healthy afternoon snack that'll satisfy that sweet tooth. So stop before you run out and go eating ALL the cookies and snacks at work this time of year, because you've got a great back-up! Enjoy a couple of these with some fresh fruit and/or nut butter and you've got the most hearty, healthy breakfast ever! Every year around the holidays, my family and I definitely have a cookie bakeoff. My mom always makes these delicious cranberry orange shortbread cookies, while I make a toasted coconut version and my grandma makes her signature classic shortbread. It's so fun to spend some time in the kitchen whipping up holiday treats and as someone who barely does any baking anymore, I really do come to look forward to it. What I don't especially like is the fact that I have such low self control when it comes to cookies so I literally try and hold out until as close to Christmas as possible to dive in and indulge. 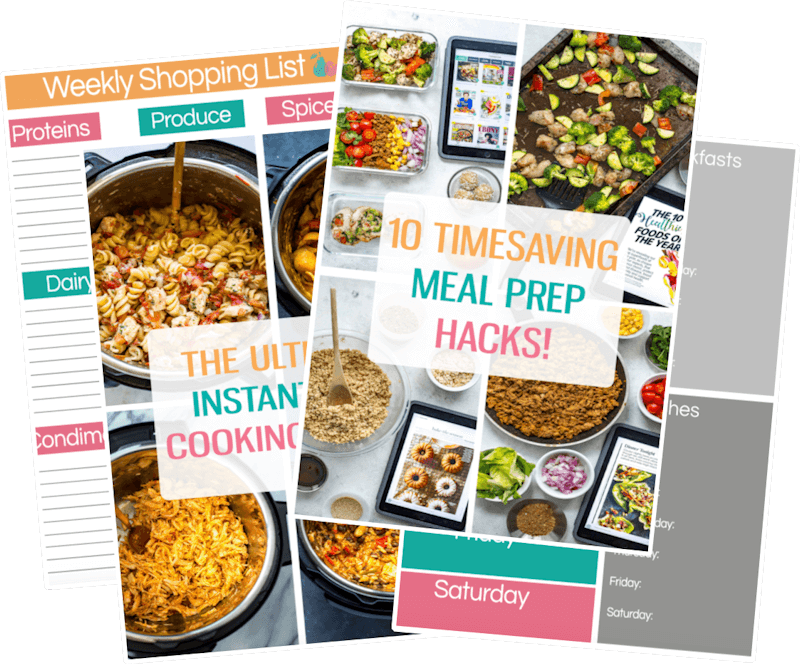 As someone who has had body image issues from time and time and trouble finding the motivation to work out and stick to a healthy lifestyle, I find that keeping on track and sticking to a regular schedule helps eliminate cravings for junk food. And I'm not saying that you shouldn't indulge – but for me personally, I find that when I start eating lots and lots of sweets, I start craving more and it can turn into this tailspin of bad eating through the holiday season. I'll make excuses to not go to the gym or get in some healthy movement, or I'll overeat and overindulge and tell myself I'll get back on track in the new year, and I think a lot of others also have this mentality. I don't know that it's healthy! I think the best way to take care of yourself is to make an effort to do so year-round, and stay focused on that. 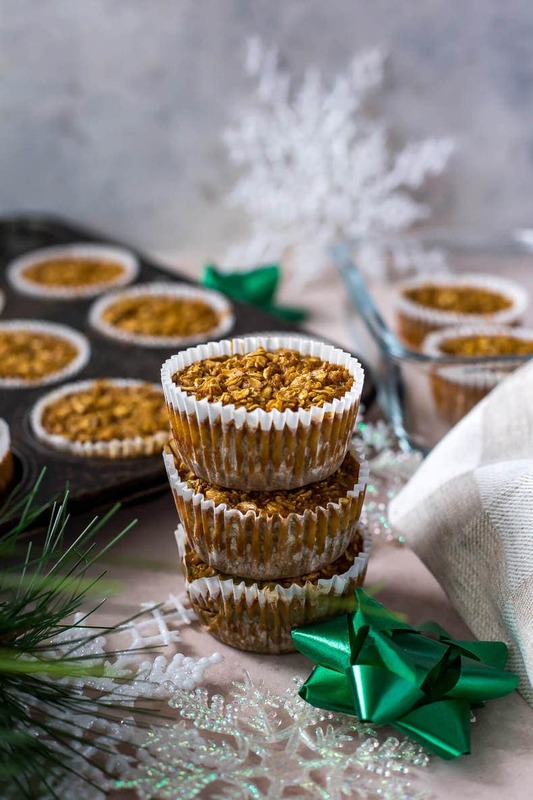 Then make delicious alternatives like these Gingerbread Oatmeal Cups that still hit your cravings, and allow you to get those flavours you enjoy without feeling like you're binging on unhealthy, sugary foods for an extended period of time. I don't know what it is lately but as I'm growing older I've developed more of an affinity for sweets when I eat them often, and we all know what too much sugar can do to a body. 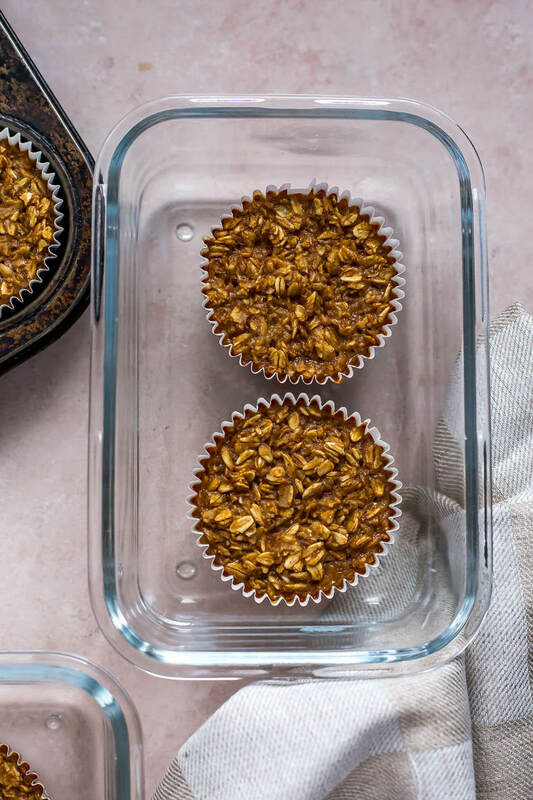 I think I just want to find more balance, and having alternatives like these Gingerbread Oatmeal Cups helps. 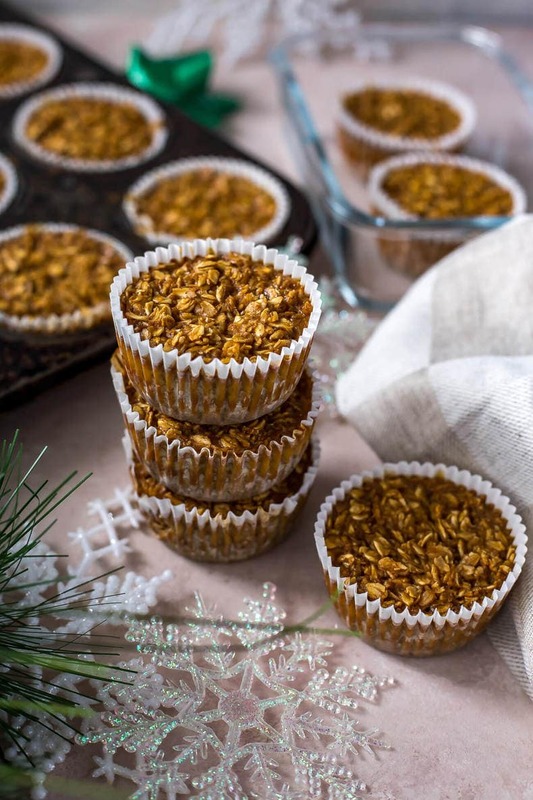 I love that these Healthy Gingerbread Oatmeal Cups are mostly refined-sugar free – I rely mostly on maple syrup and molasses to sweeten them, although I've heard coconut sugar is a another “healthier for you” sweetener that I have yet to try. 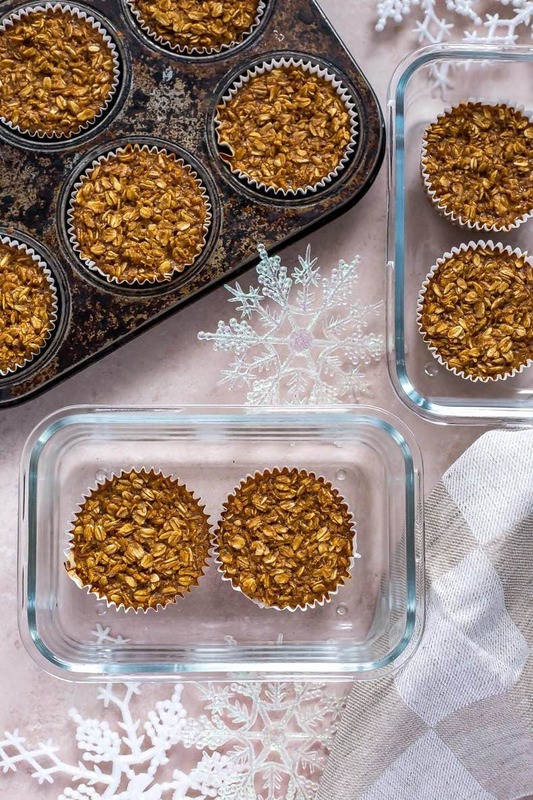 Will you be making these Meal Prep Gingerbread Oatmeal Cups? You'll love eating these for breakfast each morning – who wants boring old cereal or eggs when you can have a holiday-themed “dessert” for breakfast?! Looking for more sweet holiday recipe ideas? 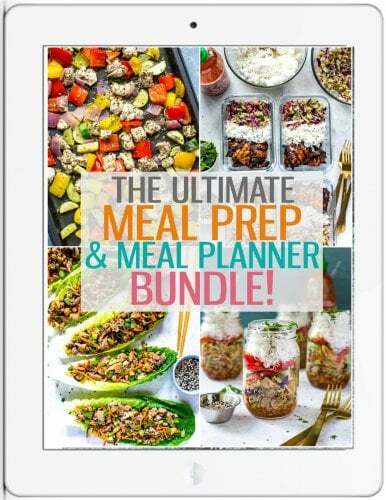 I've got you covered with these favourites below! These Meal Prep Gingerbread Oatmeal Cups are a delicious, holiday-inspired breakfast idea you can make ahead to enjoy all week long - and they're gluten-free! 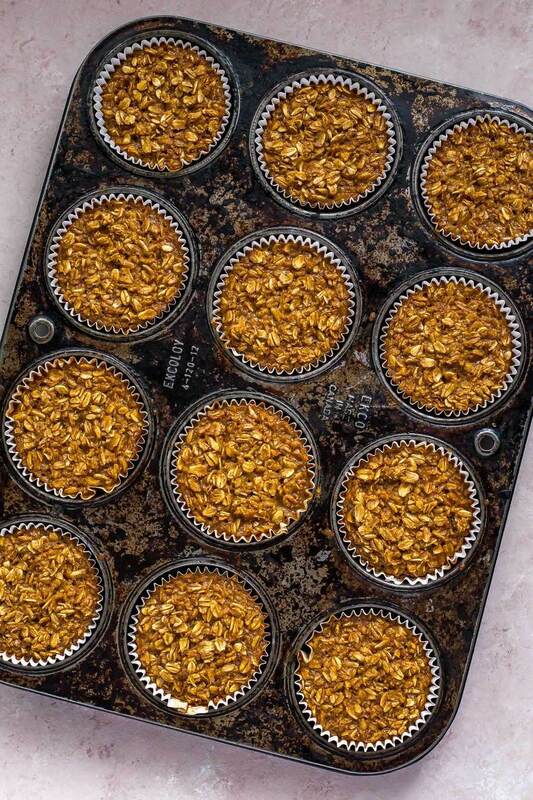 Preheat oven to 350 F. In a large bowl, mix together almond milk, molasses, eggs and maple syrup. In another bowl, mix together rolled oats, cinnamon, ginger and nutmeg. Pour wet ingredients into dry ingredients and mix together well. 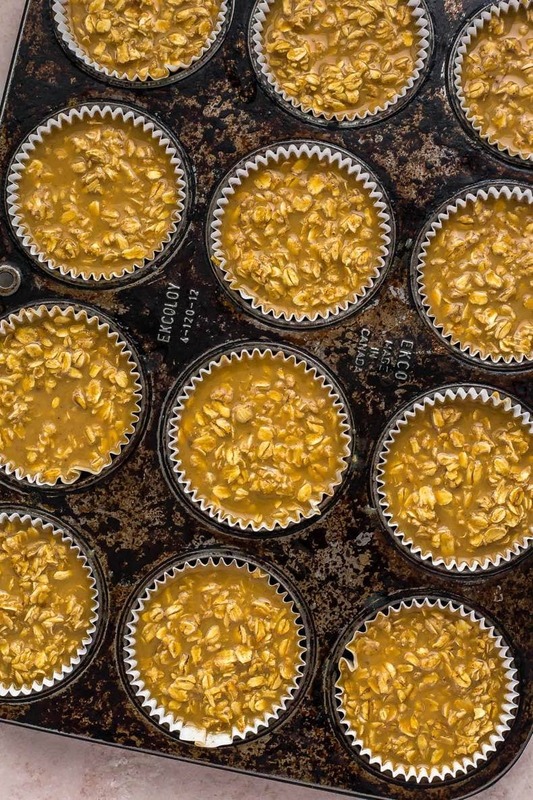 Line 12 muffin tins with muffin cup liners and divide mixture among them, making sure to get an even ratio of oats and liquid in each cup. Bake in the oven for 18 minutes. Remove from oven and let cool. Enjoy! These look delicious and so healthy! Perfect as a light snack or even a quick breakfast. Can’t wait to try them!